Deb's Cup of Tea: Thanks is not adequate enough. Thanks is not adequate enough. I've often said that although there are many words in this great English language of ours, there are times when there just isn't a word to adequately convey what you want to say. This is one of those times. I came home from work last night and shoveled off the deck and the front steps out to the mailbox. I wasn't going to shovel much beyond the mailbox but decided the milkman might appreciate a cleared walk to the milk box. So, I shoveled to the sidewalk. That was a good thing because it was warm enough, still at 4:15 to start melting the stuff on the deck and the front porch. I'll have a go at the driveway apron off and on over the weekend. I brought in the mail and the above letter was in it. It's postmarked "Chicago" and had been mailed on Tuesday, during the snowstorm. There wasn't a return address but it was kind of fat. Curious, I opened it. 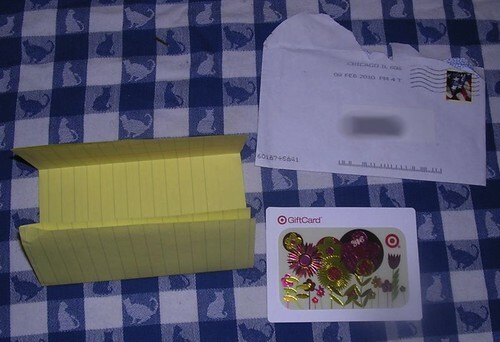 Inside was the yellow piece of paper shown above, carefully folded around the Target gift certificate shown at the bottom right. The gift certificate is for a rather large sum. I was speechless. I stood in my living room with tears running down my face. Whoever did this knows my name and address, knows my finances haven't been the best and knows I love to shop at Target and I can get pretty much anything I need at a Target, even fresh fruits and vegetables if I go to a SuperTarget. There just are no words. I don't have any clue who might have done this and I know that's exactly how they want it. I will sit down with my list tonight and make a top 10 items I need and plan to visit the store on Saturday. I am so touched and so very grateful. "Thank you" seems wholly inadequate. You have a milkman? And i'm glad there are people out there willing to extend a helping hand. Yes, I have a milkman. Oberweise Dairy (http://en.wikipedia.org/wiki/Oberweis_Dairy) west of here delivers. They have expanded their business and have moved into Indiana, Missouri, Michigan, Wisconsin, Minnesota and Virginia. If you visit their web site, you'll see they are more than just milk and milk products. Their breaded chicken planks are excellent. They were looking for sales reps to grow the business, too. My delivery date was yesterday so I got regular and unsalted butter so I can keep baking and cookies 'n cream ice cream to go on top of this brownie cake I made. I really do need a hair cut. Uh oh. She's got that tone in her voice. That's one way to get me out of bed. I love a good (bad?) pun. It's not that bad, for snow. No, I did not feel it. Welcome to Monday morning, grumble. I'm getting out of the house.